Clifton VA Free Form Swimming Pool and Poolhouse - Land & Water Design, Inc. When designing a swimming pool one of the most important considerations is location. Many homeowners may think that a pool located a distance from the house will be used less often. For this Clifton, Virginia pool and landscape project we solved that problem by creating the ultimate pool destination. Landscapes in Clifton, VA are often wooded and beautiful. They’re not often flat. This site was no exception, with the land rolling gently away from the walkout basement. The challenge became how best to tuck a pool into the slope and allow plenty of space for a pool house and entertaining on an ample pool deck. 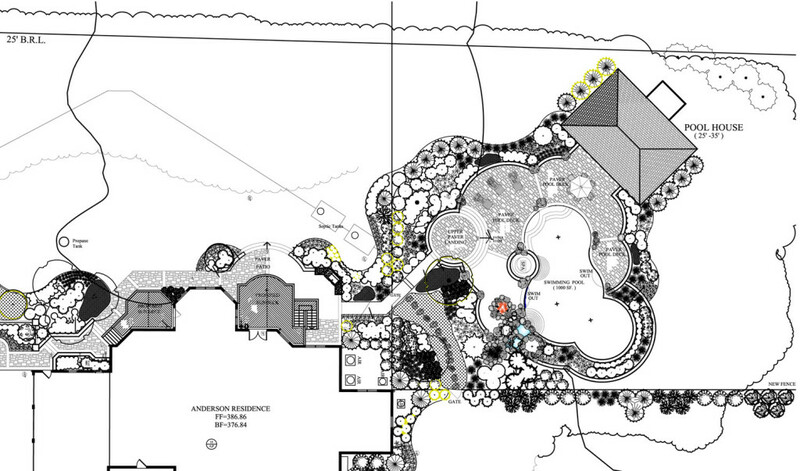 We couldn’t put the pool and pool house directly behind the home and have it fall within county-mandated setbacks. 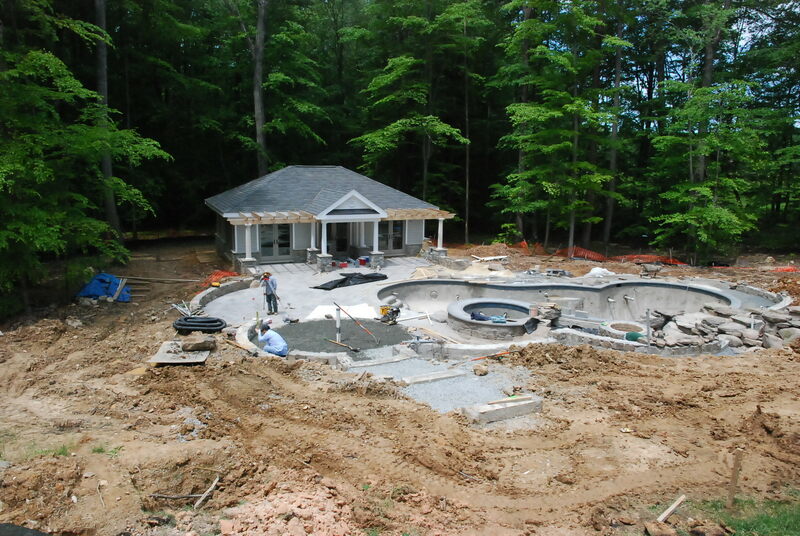 As we took in the property as a whole, we saw that this presented an opportunity to create a natural setting around a free-form gunite pool. A simplistic pathway leads from the basement walkout patio through the gate and into the pool enclosure. Descending a few steps leads to a circular landing and from there, this Virginia backyard resort is laid out in front of you. The topography of the site also presented us with an opportunity for a natural water feature, complete with streambed. Water tumbles down the slope between expertly fitted boulders and spills into the pool below. Complemented in this Clifton landscape installation by the neighboring sheer descent water feature spilling from the raised spa. Techo-Bloc Inca pavers, with their variegated color and weathered edges, create a pool deck that has beauty and mystery of an ancient South American temple. An outdoor kitchen area completes this Virginia landscape design. The clients tasked us with creating a pool house that was a “home (just) away from home.” The exterior details of the pool house echo the details on the main house, tying the various elements of the property together. The interior of the pool house reveals the level of detail the clients desired for this Clifton pool design. A stone look tile on the floor carries the shape and pattern of the Techo-Bloc Inca pavers inside but in a much warmer color palette. 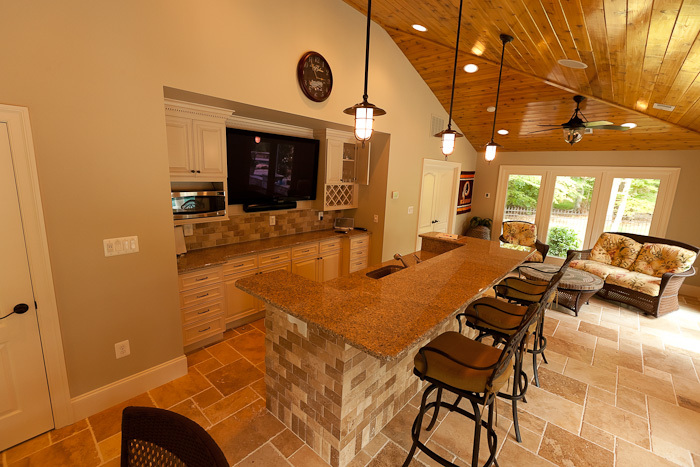 A stone-topped bar provides the central hub for the homeowners’ weekend entertaining with a flat panel tv secured from the elements. The beauty of the pool house interior is in its simplicity, creating a welcoming spot without taking attention away from the pool and backyard just outside the doors. 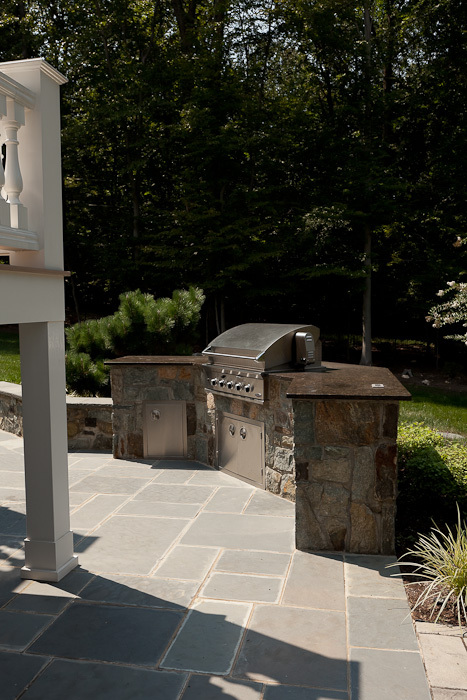 Are you unsure how to fit the elements you want into your backyard? Are you looking for an outdoor living space that will become your family’s favorite hideaway or the neighborhood entertaining hub? Contact us today to learn about how Land & Water Design can make your landscape amazing.